This is the Camperbug Suffolk camper van listings page, for VW Campervan Hire Suffolk, which contains campers that are being rented out by their owners from bases all over the county. Camper owners hire their at destinations such as Ipswich and Felixstowe also have hire spots. Check out the vans listed on the page and when you’ve found one that suits you, get in touch the vans owner for more information. Contact the owners about their Suffolk campervans for hire. I am Harold, hire me today! Based just a minutes drive from Snape Maltings and ten minutes drive from Aldeburgh. Luxury VW retro self drive camper van hire with power steering. Ideal for the Suffolk Coast. You choose the hire times and dates. We also offer self drive prom and special occasion hire. Excellent customer service and support. We are completely flexible with collection/return dates and times to fit in with your arrangements as our clients. 150 inclusive 24 hour mileage allowance for self drive camping hire. This is Harold our 1976 Volkswagen Type 2 Bay Riviera camper van with right hand drive and power steering. Harold completed a full bare metal professional renovation and engine rebuild in 2015. For camping breaks, you can rent Harold for a minimum of two nights at weekends and three nights mid week, commencing any day of the week at a time to suit you. A drive-away awning is provided free with all camping holidays together with very comfortable folding camping chairs, two tables plus cooking and dining equipment. Harold is fitted with reversing sensors, a Van Wurks oak interior and Mad Matz flooring. Empi short shift gear lever, back see viewer, blind spot mirror, safe and Goodyear cargo grade all season tyres. His front seats are the luxurious Suffolk based Newton Commercial "Captains chairs", with head and double arm rests, faced in leather matching the colours of the full width king sized rock and roll bed and side panels. The raising Penthouse roof space can accommodate two small adults in slightly narrower than a double bed. Our daily rates run for 24 hours with the option of extending your trip up to 8 hours if required for an extra £50. Two night weekend and three night midweek prices are quoted. Discounted weekly rates for hires over 7 nights are available. Also up to 24 hour self drive prom and special occasion hire is available without camping equipment for £195 with 100 inclusive miles. The standard £500 security deposit is still required. We also offer Uniformed chauffeured wedding hire within a thirty miles of Snape. Our splitscreen will transport you on your special day. Not for holiday hire and is only provided with a chauffeur, please get in touch to find out more. CrystalWhite is a newly converted and ready for use! T5 VW Campervan, 1.9 Tdi, 85bhp. 5 Birth: Two double beds in the rear and one hammock across the front window seats. 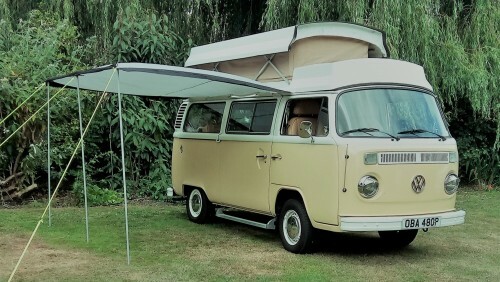 BamBam is a 1973 bay window Devon pop top in loverly cream over sand green paint work, she will sleep 2 adults and two small children in the retro top bunks, there is a cooker and grill with a sink unit and a table with seating for four.